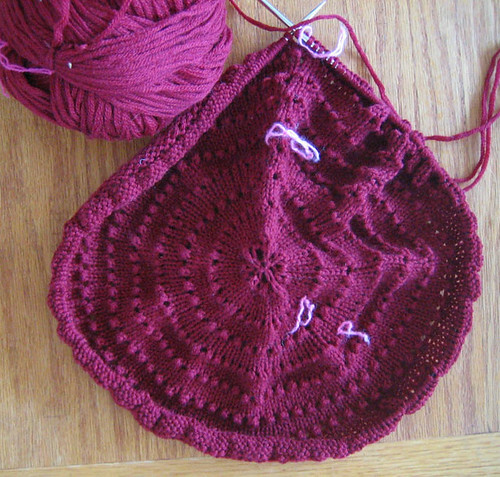 I’ve started a pi shawl, that I intend to eventually be blanket-sized. I’ve wanted to start a GIGANTIC project like this for some time, and I finally cast on. The yarn is a recycled 100% merino which is absolutely lovely; it’s about DK weight or so; and I’m knitting with US#6 needles. I was mostly inspired by the pi shawl blanket that Brooklyn Tweed made; once I saw it, it stuck in my mind and eventually I had to make one! The pattern is by Elizabeth Zimmerman. 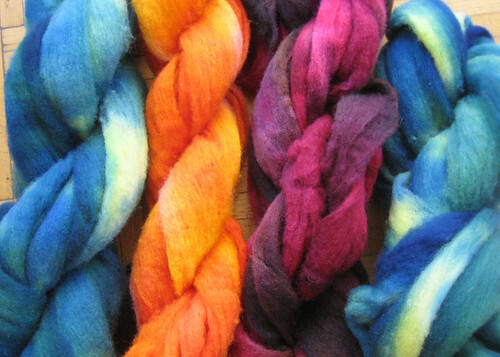 On the rawer fiber front, I’ve been up to my elbows in dye, and the results are these 3 colorways of polwarth roving, all dried out and ready to spin. And on the spindle are some initial tests of how the colors might spin up if I draft them together. I am especially happy with the reds/pinks/mauves/browns/blacks I achieved in one of the rovings. The others didn’t really turn out as planned at all; the BRIGHT orange was supposed to be mostly deep reds with a bit of orange, and the intense blue/green/yellow roving was to be a fairly consistent turquoise… well that didn’t happen. 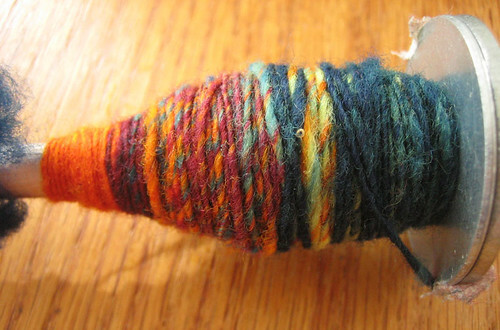 But the orange is very exciting, and the blue-greens will likely make a beautiful fabric once spun. That roving is beautiful and it looks so wonderful spun up!